The morning of October 3, 1953 dawned clear and warm – a perfect day to publicly exhibit the powers of the old steam engines. Also a good day to do the threshing and have a little fun besides. Admittedly, Steam Engine Days was started on a small scale. The first of the now annual Hesper-Mabel Steam Engine Days was nothing more than a public exhibition of oldtime threshing with steam engines, but then not all good things start big. With the coming of the gasoline engine or tractor and the modern combine, the use of steam power to “thresh” the grain was becoming a thing of the past. 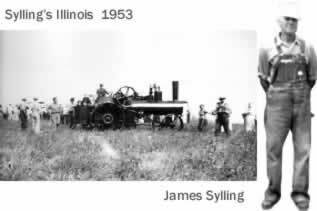 A love for the steam engine was very strong in a few men in the Hesper community and they felt this part of farm history should not be forgotten. Other communities were holding special days to keep this method of harvesting alive, so why not Hesper! They would at least have a small get-together. 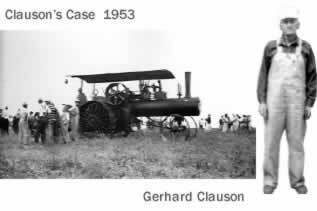 The first location of what is now an annual event was the Gerhard Clauson farm, six and one half miles east of Hesper, Iowa. 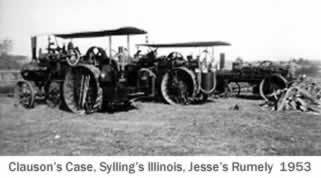 At the time, Mr. Clauson invited Jesse McMillen of Hesper, and James Sylling of Spring Grove to join him since both men also owned engines. The three men didn’t expect any widespread interest, but all were prepared to have a good time anyway. Mrs. Clauson recalled that she and her husband’s sister were prepared to serve lunch themselves. Several doughnuts were purchased at a bakery, but as this supply vanished, homemade cookies were brought out of storage and used. A hot-dog stand was also on the premises. Because the only form of advertising had been spread by word-of-mouth, Clauson and the others were very surprised when crowds of several hundred came to view the exhibition. Even the cool weather of the afternoon didn’t chase the crowds away. 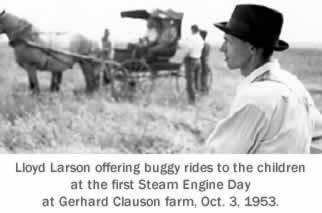 No elaborate entertainment had been planned for the exhibition of steam engines in 1953, but the children were treated to horse and buggy rides over much of the farm by Lloyd Larson. Another avid steam engine man was a Mr. Christau, “Krink”, as he was called. Somehow he had heard of this get-together and wanted to be there. He was from Grand Meadow, Minnesota. He and his wife decided to come to see the steam engines that day. As they arrived in the Hesper and Mabel area, he inquired how to get to this event. No one he happened to ask had heard about it, so they were of no help. Mr. Christau started down some gravel roads and all of a sudden he realized he saw the tracks of a large steam engine’s wheels in the road. So, he and his wife just followed them and soon they were enjoying themselves at the Clauson farm. All in all, the exhibition was considered a great success. The three men who organized the event and those attending had felt that it was quite an idea. It seemed that there was an interested in the old steam horses, so there was talk of holding another exhibition again the following year. The talk was not in vain. In 1954, another celebration was held, this time on the Charlie McMillen farm west of Hesper. More publicity was given, and in 1954 the first buttons for the event were sold. The buttons provided an even greater attraction and the crowds grew. In a nearby field belonging to Charlie Sellman, twelve airplanes bearing spectators landed. This was startling considering the mild interest Mr. Clauson had expected when he suggested the idea. However, even at the first exhibition, eight or nine airplanes had landed bringing interested people to the event. 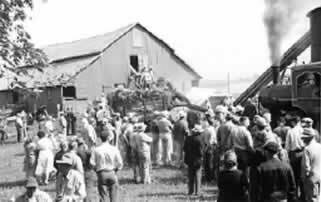 Mrs. Aurthur Anderson made a tape recording of the engines as they paraded up the driveway to the field to begin “threshing”. In the fall of that year, Charlie McMillen’s son-in-law, Arthur Anderson and family moved to the farm and for years following he plowed up pop bottles and other remnants of that day. Cars were parked all over the farm and even in neighboring fields. A few more side events were added that year including the Hesper Improvement Club food stand. They continued until 1972. Because the event had aroused such an interest, each fall over Labor Day weekend, the event was continued on farms in the Hesper area. In 1955 a large crowd gathered at the Otto Rasmussen farm to view the steam engines. 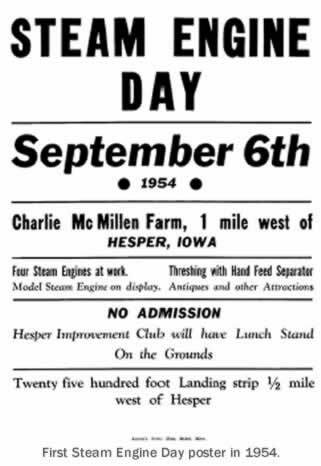 Hesper Steam Engine Days were held on the Fred Koppen farm in 1956. 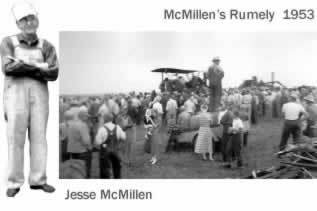 In 1957 festivities were again held on the Rasmussen farm with the Koppen farm the site of the event in 1958 and 1959. In 1959, Jesse McMillen added another steam engine to the collection which was drawing such interest. After fourteen months of work, he was able to demonstrate a “midget” engine, a half-scale Advanced Rumley at Steam Engine Days. Mr. Christau was a builder of steam engines, and Jesse McMillen hired him to build this engine. Jesse, and his brother Charlie spent many days in Grand Meadow helping “Krink” build. Although Charlie McMillen no longer owned an engine, he enjoyed helping his brother. Later they built an upright which added more interest to the celebration. After the festivities in 1959, the six men who had kept the event going – Gerhard Clauson, Jesse McMillen, James Sylling, Charlie McMillen, Dewey Golberg, and Arnold Peterson – were wondering how they could continue as the crowds were getting almost too large to handle. The public expressed a wish that it not be discontinued. At this time the Mabel community saw this as an opportunity for them to offer a place to hold the event. So, in 1960, Mr. Odell Lee Sr., acting on behalf of the Mabel Business Association, contacted Jesse McMillen and urged the Hesper group to move their steam engine activities to Mabel. This sounded like a good idea to the Hesper group, so, on the first Friday after Labor Day in 1960, the first Hesper-Mabel Steam Engine Days came into existence. In cooperation with the Mabel Business Association, a complete celebration with parades, entertainment, in the form of a carnival, Queen contests, fall games, and many other activities was set up, although the main attraction remained the old steam horses. “Hesper-Mabel Steam Engine Days” had been born. The festival which made Mabel more than a tiny dot on a map, however, depended upon the community for its growth. Today cars from almost every state may be found on the grounds. This success is certainly due largely to the participation of so many local organizations. The Mabel Business Association continues to plan for this day as the outstanding event of the year. As many as 50,000 people attended the festival in 1967, and an average of 35,000 a year make it a great “weekend”. Members of many groups such as the area 4-H clubs and farm organizations contribute greatly by making floats for the parade and sponsoring events such as the queen contest which actually started when Hesper held it alone around 1957. It has become one of the highlights to Steam Engine Days. The VFW sponsors a “Kiddie parade” each year. This preceeds the large parade led by the steam engines. They have had to have their iron wheels “padded” so as not to ruin the black-top roads. Towns nearby add their bit to the parade also. The Shriners from Rochester usually put on their motorcycle demonstration on one of the days. The churches in the area have all contributed. The Hesper Lutheran Church and Mabel First Lutheran Church have food stands on the grounds. A later addition and one which is enjoyed by everyone is the church service on Sunday morning. A guest pastor is brought in for the service. Special music is provided by area groups. In place of a bell tolling three times, a steam engine whistle is blown three times. This seems so very appropriate and sends shivers up the spines of those who cherish the memory of those “good ‘ol days”. New attractions are constantly being added including window displays, flower shows, art contests, and an antique show. Arts and crafts are displayed by local and distant personnel. Although “steam” is still the main display used not only to thresh but to saw wood, etc., a display of gas engines, antique and new, has been added. And, as some of the original founders have passed on, new faces appear as the interest continues. Lloyd Foltz has taken over Jesse McMillen’s engines. Through all of the changes and updating, Steam Engine Days has undergone, the basic idea to exhibit the old steam horses has not been lost even though they have many modern attractions to compete with. Perhaps that is why people from all over the United States are attracted to the tiny village of Mabel each September to gaze at the mighty steam engines and to mingle with the people who works so hard to make it possible.